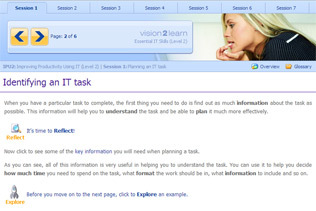 Essential IT Skills Level 2 on vision2learn for schools leads to the new Information Technology Qualification ITQ in IT User Skills at Level 2. This vocational qualification is designed to demonstrate students' competence in using IT and help them to improve their existing skills. Essential IT Skills Level 2 is suitable for KS3 year 9 students and KS4 year 10 and 11 students. The units are flexible and can be combined to create a Level 2 Award or Certificate qualification, depending on the needs of the individual learner. Each ITQ unit has a credit value. Learners will need to build up 10 credit values to achieve a Level 2 Award in IT User Skills (QCF) and 16 credit values to achieve a Level 2 ITQ Certificate in IT User Skills (QCF). The units and their individual credit values are summarised below. Using shortcuts, customised menus / toolbars and templates. Maintain an IT system and troubleshoot IT problems. Browsing the web and searching for information.